The Voigt V et al. 2016 study found that, "... Having non-metastatic breast cancer substantially increases the load of post-traumatic stress. After diagnosis, the vast majority of patients with breast cancer suffer from post-traumatic symptoms, which are still present in more than half of the patients 1 year later, independently from tumor stage, type of surgery, and chemotherapy." Further, " ...As many as 82.5% of the patients initially showed BC-related PTSD symptoms that had not resolved in 57.3% a year later." It should be noted that there were a mean of three symptoms of post-traumatic stress before treatment and less than two symptoms a year later. EDITORS' NOTE; Considering another 2015 study (cited below) that found that chronic stress may remodel lymph vasculature to promote tumor cell metastasis, it is even more imperative that breast cancer patients be the beneficiaries of kind support. If anything, we believe that the numbers of post-traumatic symptoms are underestimated. What breast cancer patient, even decades later, can forget any word uttered, every action taken, during the breast cancer diagnosis and treatment period? See Voigt V et al., Clinically Assessed Postraumatic Stress in Patients with Breast Cancer During the First Year After Diagnosis in the Prospective, Longitudinal, Controlled COGNICARES Study,Psycho-Oncol, 2016. "Stress remodels lymphatic vasculature through a tumor neural-inflammatory axis to promote lymphogenous tumor cell dissemination and metastasis. Tumor cell-derived VEGFC is necessary for stress-enhanced lymphatic remodelling but is not directly activated by β-adrenoceptor signalling. Tumor-associated macrophages respond to β-adrenoceptor signalling to produce inflammatory molecules such as PGE2, which may then signal to tumor cells to produce VEGFC required for lymphatic remodelling. These effects may be clinically blocked using BBs (beta -blockers), anti-VEGFC therapeutics (αVEGFC) or COX2 inhibitors (COX2i). E, epinephrine; NE, norepinephrine; β-AR, β-adrenoceptor." Le C et al., 2016. READ DOWN FOR DISCUSSION. ​ while massage-like stroking increases T-cells in mice. "Both human (finger-driven) and non-human (brush stroke-driven) stroking (in mice) showed a trend towards an increase in T cell number in lymphoid organs. However, only hand-delivered-stroking showed a statistical significant difference compared to control," Major B et al., 2015. READ DOWN FOR STUDY. escape while also being a rich source of chemokines that can promote the invasive properties of tumor cells. Furthermore, tumor-draining lymph nodes and associated lymphatic endothelium have been shown to develop an immunosuppressive environment which promotes immune tolerance to the cancer and facilitates tumor growth and spread." What happens when there is chronic stress in mice with tumors? "Chronic stress induces signaling from the sympathetic nervous system and drives cancer progression, although the pathways of tumor cell dissemination are unclear." The Le C et al. 2016 study found that "chronic stress restructures lymphatic networks within and around tumors to provide pathways for tumor cell escape. 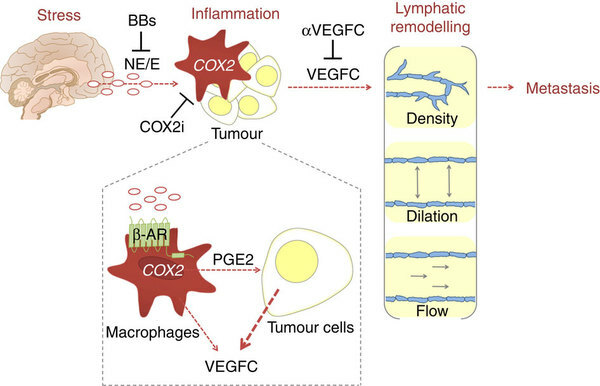 We show that VEGFC derived from tumor cells is required for stress to induce lymphatic remodeling and show that this depends on COX2 inflammatory signaling from macrophages." The study mentions ways to inhibit the signaling of the sympathetic nervous system, such as beta-blocker drugs, etc. SEE IMAGE ABOVE. Le C et al., Chronic Stress in Mice Remodels Lymph Vasculature to Promote Tumor Cell Dissemination, Nature Communications, 2016. "The best way to describe the practice of massage is as a mechanical manipulation of body tissues by means of rhythmically applied strokes and pressure." Major B et al., 2015. "Natural Killer cell numbers (NK cells) increased by 12% for the massage group. This may be of clinical significance given that NK cells fight tumors and viruses. Dopamine and serotonin levels, neurotransmitter levels associated with depression, also increased by 59% and 36% respectively, corroborating the massage group's self-report of decreased depressed symptoms." Hernandez-Reif M et al., 2005. "Together our results in mice support the hypothesis that massage-like therapies might be of therapeutic value in the treatment of immunodeficiencies and related disorders "
"Human biofield therapy (Therapeutic Touch) had no significant effect on the primary tumor but produced significant effects on metastasis and immune responses.".. ​ Gronowicz G et al., 2015. CAN MASSAGE AND TOUCH THERAPY HELP BREAST CANCER PATIENTS? In the Hernandez-Reif M et al. 2005 study, the researchers sought to determine the psychological as well as the immune boosting effects of massage therapy. Breast cancer patients were divided into two groups. Some breast cancer patients received 30 minutes of massage three times a week for five weeks. The other patients in the relaxation group had muscle relaxation exercises during this time. At the beginning and at the end of the study, women were queried about their mood, pain, and anxiety. In addition, blood and urine samples were collected for hormone and immune system values. Results: "...By the end of the study, only the massage group reported being less depressed, anxious and angry and having more vigor. 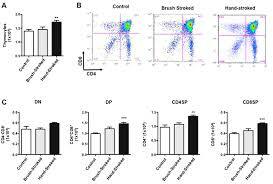 ... Natural Killer cell numbers (NK cells) increased by 12% for the massage group. This may be of clinical significance given that NK cells fight tumors and viruses. Dopamine and serotonin levels, neurotransmitter levels associated with depression, also increased by 59% and 36% respectively, corroborating the massage group's self-report of decreased depressed symptoms." Conclusion: "Overall, these finding support the use of massage therapy for women with breast cancer to improve their psychological as well as their biochemical and immune profiles." NETWORK BETWEEN CUTANEOUS NERVES, NEUROENDOCRINE AXIS, AND IMMUNE SYSTEM MASSAGE INCREASES THYMUS AND SPLEEN T-CELLS! "Male mice were subjected to massage-like therapy (hand-stroked or brush-stroked) or left untouched (control) for 7 days and then analysed for their T cell repertoire in the thymus. (A) The bar graph shows the total number thymocytes recovered at the end of the treatment while (B) shows representative dot plots of the different subpopulations of thymocytes: double negative CD4-CD8- (DN; bottom left quadrant), double positive CD4+CD8+ (DP; top right quadrant), single positive CD4+ (CD4SP; bottom right quadrant), single positive CD8+ (CD8SP; top left quadrant). (C) Shows the absolute numbers of each subpopulation mentioned above. Values are expressed as mean ± S.E.M. and representative of four experiments, each involving 6 mice per group." In the 2015 Major B et al. study, the researchers premised their research on the "positive effect of emotional well being and immune response" in massage therapy. The researchers "sought to set up an experimental system that would allow us to explore the immunomodulatory effects of massage-like therapy in mice. To this aim we tested the effects of stroking as surrogate for massage and we also compared human (finger-driven) and non-human (brush stroke-driven) approaches to assess two different types of stroking. The mice were either glove-stroked or stroked with a brush for sixty minutes for seven days. Results: Hand- but not brush-stroked mice had a "significant" increase in thymic and splenic T cells. "The boosting effects on T cell repertoire of massage-like therapy were associated with a decreased noradrenergic (neurons in central nervous system containing the neurotransmitter, noradrenalin), innervation of lymphoid organs and counteracted the immunosuppressive effect of hydrocortisone in vivo." The researchers don't know how this massage-like stroking decreases the noradrenergic tone, although there are hints that there is "an interactive network between cutaneous nerves, the neuroendrocine axis, and the immune system". Thus, ..."The skin can be genuinely considered a neuroimmunoendocrine organ that contains a wide variety of functions through the peripheral sensory nervous system, the autonomous nervous system, as well as the central nervous system." Conclusion: Just as in humans, similarly in animals, there is an efficacy of massage in treating immunodeficiencies. The researchers pointed out that there is some evidence in the medical literature "that massage may support the recovery of immune function during periods of immunosuppression, counteracting the loss of T cells in patients suffering from cancer and HIV infection. Although peripherally comparable to these studies, our results support these findings and suggest that massage contributes to the maintenance of immunocompetence." Thus,"Together our results in mice support the hypothesis that massage-like therapies might be of therapeutic value in the treatment of immunodeficiencies and related disorders and suggest a reduction of the inhibitory noradrenergic tone in lymphoid organs as one of the possible explanations for their immunomodulatory function." CAN THERAPEUTIC TOUCH AFFECT THE IMMUNE FUNCTION OF MICE WITH BREAST CANCER? YES! ..... "Significant effects on metastasis and immune responses"! biofield therapy to see if this therapy would have any effect on breast cancer in a mouse model. In their study, the researchers forged a very aggressive breast cancer in mice. Therapeutic Touch or sham touching was performed twice a week for ten minutes on the mice. At 26 days, the mice were tested for signs of lymph node metastasis. Results? "Metastasis was significantly reduced in the Therapeutic Touch-treated mice compared to mock-treated mice. Cancer significantly elevated eleven cytokines. Therapeutic Touch significantly reduced IL-1-a, MIG, IL-1b, and MIP-2 to control (healthy) levels." Therapeutic Touch significantly reduced specific splenic lymphocyte subsets and macrophages that were significantly elevated with cancer. ... Macrophages and some lymphocyte groups were also significantly decreased by Therapeutic Touch, suggesting this human biofield therapy has significant effects on immune function, which may mediate the decrease in metastasis." To elaborate, "Therapeutic Touch significantly affected the % of macrophages and the levels of cytokines that activate macrophages and/or are produced by activated macrophages. These data suggests that Therapeutic Touch specifically targets macrophages to elicit significant effects in breast cancer. Macrophages have been shown to promote tumor progression and metastasis in breast cancer." To reiterate, Therapeutic Touch significantly decreased the % CD11b+ macrophages and brought down the levels of macrophage-related cytokines, IL-1, IL-1, and MIP-2, to normal levels." Note that while there was an effect on metastasis, there was no effect on the primary tumor. The researchers wondered if the Therapeutic Touch might have worked on the primary tumor if it had been less aggressive or if the dose had been changed. Conclusion: "Human biofield therapy (Therapeutic Touch) had no significant effect on the primary tumor but produced significant effects on metastasis and immune responses... This study is the first to show modulation of immune function by human biofield therapies with possible positive outcomes in breast cancer progression." "Thus, the restorative function of sleep may be a consequence of the enhanced removal of potentially neurotoxic waste products that accumulate in the awake central nervous system." Xie et al., 2015. "We propose that the most popular sleep posture (lateral) has evolved to optimize waste removal (brain toxins) during sleep." Lee H et al., 2015. ​SHORT SLEEP DURATION CAN LEAD TO VENTRICULAR EXPANSION IN BRAIN - VENTRICLES EXPAND DUE TO BRAIN INSULTS, SUCH AS SCHIZOPHRENIA, BIPOLAR, NEURODEGENERATIVE DISORDERS, IN ADDITION TO AGING. In the Lo JC et al. 2014 study, the researchers hypothesized that short sleep duration could have an effect on the brain - "changes in hippocompal, ventricular, and prefrontal volumes as well as a more pronounced decline in neuropsychological test performance over a two year interval". In their experiment, self-reported short sleep patterns in healthy people 55 years and older was followed up by MRI and neuropsychological testing in two years. Results: There was "faster ventricular expansion and faster decline in general cognitive performance in the subsequent two years. ...The ventricles are more sensitive to the effects of sleep duration. Ventricles can expand as a result of a variety of brain insults, schizophrenia, bipolar disorder, and neurodengerative disorders in addition to aging. Notwithstanding, an increased rate of expansion in older adults is a reliable marker for risk of cognitive impairment." Conclusion: "In healthy older adults, short sleep duration is associated with greater age-related brain atrophy and cognitive decline. These associations are not associated with elevated inflammatory responses among short sleepers." (See Lo JC et al., Sleep Duration and Age-Related Changes in Brain Structure and Cognitive Performance, SLEEP, 2014.). In the Wigren HK and Stenberg T 2015 study, the researchers wondered how sleeping can restore our brains after learning. Summary: "Sleep after learning improves learning outcomes. According to the theory of synaptic homeostasis, the total strength of synapses, having increased during the day, is restored during sleep, making room for the next day's experiences. According to the theory of active synaptic consolidation, repetition during sleep strengthens the synapses, and these strengthened synapses form a permanent engram. According to a recent study, removal of waste products from the brain may also be one of the functions of sleep." REMOVE AMYLOID BETA -- GET SOME SLEEP! What vital function does sleep play? In the Xie L et al. 2013 study, the researchers found that sleep helps to remove neurotoxic waste. Background: "Proteins linked to neurodegenerative diseases, including β-amyloid (Aβ), α-synuclein, and tau are present in the interstitial space surrounding cells of the brain. In peripheral tissue, lymph vessels return excess interstitial proteins to the general circulation for degradation in the liver. Yet despite its high metabolic rate and the fragility of neurons to toxic waste products, the brain lacks a conventional lymphatic system. Instead, cerebrospinal fluid (CSF) recirculates through the brain, interchanging with interstitial fluid (ISF) and removing interstitial proteins, including AB." Findings: "In live mice, we show that natural sleep or anesthesia are associated with a 60% increase in the interstitial space, resulting in a striking increase in convective exchange of cerebrospinal fluid with interstitial fluid. In turn, convective fluxes of interstitial fluid increased the rate of β-amyloid clearance during sleep. Thus, the restorative function of sleep may be a consequence of the enhanced removal of potentially neurotoxic waste products that accumulate in the awake central nervous system." Conclusion: "Because of the high sensitivity of neural cells to their environment, it is essential that waste products of neural metabolism are quickly and efficiently removed from the brain interstitial space. Several degradation products of cellular activity, such as Aβ oligomers and amyloid depositions, have adverse effects on synaptic transmission and cytosolic Ca2+ concentrations and can trigger irreversible neuronal injury.... Because biological activity is inevitably linked to the production of metabolic degradation products, it is possible that sleep subserves the important function of clearing multiple potentially toxic CNS waste products. Our analysis indicates that the cortical interstitial space increases by more than 60% during sleep, resulting in efficient convective clearance of Aβ and other compounds. ...An extension of the findings reported here is that the restorative function of sleep may be due to the switching of the brain into a functional state that facilitates the clearance of degradation products of neural activity that accumulate during wakefulness." SLEEP ON YOUR SIDE TO HELP CLEAR BRAIN TOXINS! -WONDERFUL STUDY IN MICE! We just learned that sleep helps to remove neurotoxins. How to promote the removal of these brain toxins? In the Lee H et al. 2015 study, the researchers, via imaging, investigated the effect of body posture on ridding brain toxins.in anesthetized mice. Background: "The glymphatic pathway expedites clearance of waste, including soluble amyloid β (Aβ) from the brain. Transport through this pathway is controlled by the brain's arousal level because, during sleep or anesthesia, the brain's interstitial space volume expands (compared with wakefulness), resulting in faster waste removal. ... . Therefore, not only the level of consciousness, but also body posture, might affect CSF(cerebral spinal fluid)–interstitial fluid (ISF) exchange efficiency." Conclusion: Sleep on your side to get rid of brain toxins! "The major finding of our study was that waste, including Aβ, removal was most efficient in the lateral position (compared with the prone position), which mimics the natural resting/sleeping position of rodents. Although our finding awaits testing in humans, we speculate that the lateral position during sleep has advantage with regard to the removal of waste products including Aβ, because clinical studies have shown that sleep drives Aβ clearance from the brain." In the Lin X et al. 2015 meta-analysis study, the researchers reviewed sixteen investigative studies on night shift work relative to breast cancer and other diseases. Their efforts were "to quantify a potential dose-response relationship between night shift work and morbidity of breast cancer, and to evaluate the association between NSW and risk of all-cause mortality"
"In summary, night shift work increased the risk of breast cancer morbidity by: 1.9% for 5 years, 2.5% for 5-10 years, 7.4% for 10-20 years, and 8.8% for >20-years of night shift work. Additionally, rotating night shift work enhanced the morbidity of breast cancer by 8.9%. Moreover, night shift work was associated with a 2.7% increase in cardiovascular death." SLEEP - ALTERNATING LIGHT-DARK CYCLES - CIRCANDIAN DISRUPTION - CAUSAL EVIDENCE FOR INCREASED BREAST CANCER RISK IN MICE! "The present study underlines the importance of internal desynchronisation, sleep disruption and timing of food intake in the relationship between shift work and adverse health effects, especially breast cancer and obesity. Melatonin suppression and decreased vitamin D by less sunshine exposure were excluded in our model"
Although epidemiological studies in shift workers and flight attendants have associated chronic circadian rhythm disturbance with increased breast cancer risk, causal evidence for this association is lacking." Thus, in the Van Dycke K et al. 2015 study, the researchers exposed mice, with a predilection for getting breast cancer, to weekly alternating light cycles to see if this change in light cycles would increase the risk of breast cancer. Results: "Animals exposed to the weekly light-darkness inversions showed a decrease in tumor suppression." Conclusion: Not only did the light-dark cycles decrease tumor suppression, but the changes in light cycles caused a "significantly stronger weight gain" in the mice. Importantly, this study provides the first experimental proof that circadian rhythm disturbances increase breast cancer development. Finally, our data suggest internal desynchronization and sleep disturbance as mechanisms linking shift work with cancer development and obesity." From Science News, here is a quote from one of the researchers: "The conclusion is that chronic changes in light schedules are a driving factor for breast cancer development, weight gain, and other metabolic problems," says senior study author Bert van der Horst of Erasmus University Medical Center. In addition, as analyzed by Till Roenneberg (Ludwig-Maximilian University, Munich, Germany), sleep patterns were chronically disturbed. "This outcome is in line with what has been found in epidemiological studies in humans, and now provides strong causal evidence for circadian disruption as a carcinogenic factor."